Nothing mini about this Suite! Express yourself with this special collection of our Krispette Mmmminis. 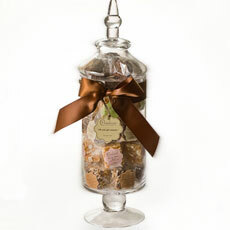 A giftable sampler of our Mmmminis in a Glass Apothecary Jar. Tied with a lavish chocolate brown satin ribbon and signature tag. Makes a sweet gift! Filled with 28 of our little two-bite Mmmminis a variety of flavors including: Triple Chocolate Nirvana, Sweet Joe, The Great Almondo, and more. Once the Mmmminis are gone enjoy the classic styling of this apothecary jar.